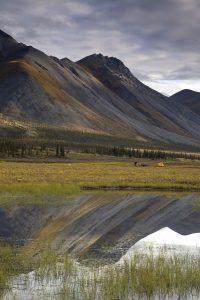 The Gwich’in people consider the coastal plain of the Arctic National Wildlife Refuge sacred. USFWS photo. Last month the Trump administration dropped a hasty draft environmental impact statement aimed at steamrolling oil and gas drilling in the coastal plain of the Arctic National Wildlife Refuge. The public by law can review and comment on the draft EIS, and now has until March 13 to do so. Unsurprisingly, the Bureau of Land Management dropped the ball. Its draft EIS fails to evaluate how oil and gas development fulfills the purposes outlined for the Arctic Refuge in federal law. These purposes include safeguarding wilderness, wildlife, habitat, and subsistence activities. Scroll down for a list of significant flaws in the draft EIS. The coastal plain—an area considered sacred to the Gwich’in people—provides vital calving and nursing grounds for the Porcupine Caribou Herd. The coastal plain offers cows and calves a place to find nutrient-rich food and safety from predators and insects, which can kill calves. Developing oil and gas fields in the coastal plain disregards the health of the herd and dismisses the human rights of the Gwich’in people, whose relationship with the herd sustains their culture, food, and way of life. The draft EIS fails to demonstrate how the Gwich’in people’s way of life will be protected or to address their many concerns. The majority of Americans oppose drilling in the Arctic Refuge. Photo by Hilllebrand, USFWS. Polls show that the overwhelming majority of Americans oppose drilling in the Arctic Refuge. Republican and democratic administrations have kept the region closed to drilling for decades. Alaska Senator Lisa Murkowski pushed a provision to drill in the coastal plain into the Tax Cuts and Jobs Act of 2017. In other words, she used political wheeling and dealing to tuck it into a tax act rather than properly debating the issue in public. The act requires two lease sales within seven years. Trump’s insistence on building a wall on the southern border on the backs of taxpayers led to an ongoing government shutdown. Though hundreds of thousands of government workers have gone without paychecks, including BLM, and residents have gone without services, his administration tried to continue with scheduled public hearings during the shutdown. The Arctic Refuge. Photo by Alaska Wilderness League. Public and congressional pressure forced BLM to postpone those meetings, but the agency did not extend the comment period deadline or expand the number of hearings. The deadline to comment is Feb. 11. Now is the time to show up for the Arctic Refuge and tell this Administration why oil and gas has no place in the Arctic Refuge. When you make yourself heard during the public comment period, you help point out the flaws and concerns necessary to hold BLM accountable to its job and the law. Speaking out at hearings or sending emails and letters to BLM lets your public servants know that you expect them to honor and protect human rights, public health, and the purpose of public lands. Comments can be submitted via the website, blm.gov/alaska, or by mail to Coastal Plain Oil and Gas Leasing Program EIS, 222 W. Seventh Ave., Stop #13, Anchorage, Alaska 99513. 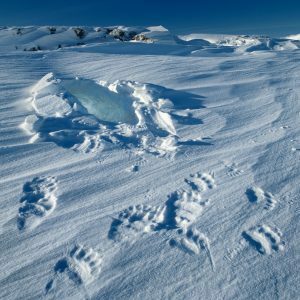 Polar bear tracks near a den on the coastal plain. 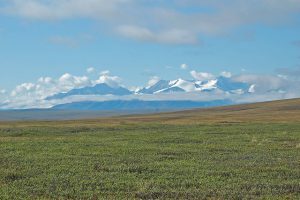 The draft EIS fails to protect the purposes established for the Arctic Refuge, namely safeguarding wilderness, wildlife and habitat, recreation, water resources, and traditional uses of lands and animals for food and culture. 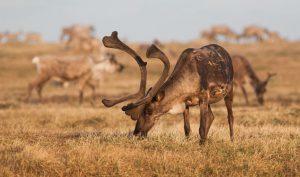 The draft EIS fails to protect the Porcupine Caribou herd. It acknowledges that oil and gas activity will disturb and displace caribou, but it does not fully address the impacts or look at the full range of areas important to the herd’s health. The draft EIS ignores the traditional knowledge and human rights of the Gwich’in people. The draft EIS fails to protect polar bears, a key Arctic animal threatened under the Endangered Species Act. Over 77 percent of the Arctic Refuge is formally designated as critical habitat for polar bears, and the coastal plain provides key denning habitat for bears with cubs. The draft EIS fails to provide details on how many bears could be harmed or how it will prevent or reduce injury and death. The draft EIS fails to protect birds that migrate to all parts of the United States and world. The coastal plain provides essential nesting, foraging, and migratory stopover habitat for millions of birds. The draft EIS offers fleeting and sometimes outright incorrect analysis of the impacts of oil and gas activity on bird populations while providing loopholes that would allow oil and gas development regardless of the harm to birds. 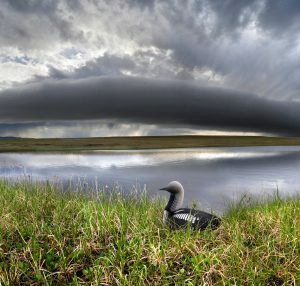 A Pacific loon in the Arctic Refuge. Photo by Malkolm Boothroyd. The draft EIS fails to protect water. 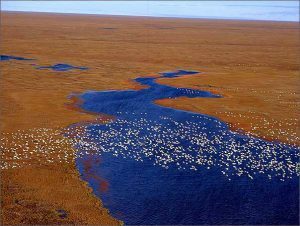 The coastal plain of the Arctic Refuge does not contain large quantities of fresh water. It is scarce, particularly in the winter. The draft EIS acknowledges that drilling an oil well could use as much as two million gallons of water and that constructing a mile of ice road would require one million gallons of water, but it fails to quantify the total water needs of development, identify where the water will come from, or address how using this scarce resource would impact fish, habitat, vegetation, and the hydrology of the region. The draft EIS does not address the currently proposed seismic work, which would harm denning polar bears and affect foraging areas for caribou and other animals. While trying to authorize seismic activities through a different process, BLM fails to analyze the impacts of seismic exploration in this draft EIS, which arbitrarily and shortsightedly limits its analysis to leasing and later exploration. This narrow view is not consistent with BLM’s obligation to consider all the environmental impacts of the oil and gas program. The draft EIS does not address the changing climate, or its definitive and devastating impacts on Arctic communities. The Arctic is warming at more than double the rate of the rest of the country, with dozens of Alaska villages in need of relocation. The draft EIS fails to assess how expanding fossil fuel development in the coastal plain would increase the social, cultural, economic and public health hardships born by Arctic communities due to climate change. The draft EIS fails to quantify emissions of pollutants or address the impacts of air quality on people, animals, and the health of the region. North Slope activities indicate that oil and gas development has significant impacts on air quality and visibility. BLM’s analysis underestimates the potential frequency of oil spills and the size of those spills. The DEIS relies on data that is out of date and in some instances, questionable to begin with. Spills have occurred and continue to occur across the North Slope, with an average of a spill of 1,000 gallons or more nearly every other month. BLM fails to consider the likely and significant impacts oil spills could have on sensitive Coastal Plain resources and the Gwich’in people who rely on them.